How do I view or edit loan due date reminders in online banking? To adjust the reminders that appear in the sidebar, log in to online banking and follow the instructions listed below. 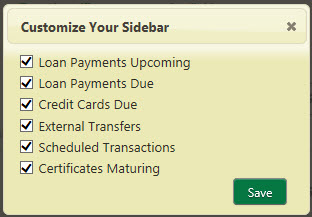 By default, online banking loan payment reminders appear and can be edited in the sidebar of online banking. Click on Settings to edit your reminders (see screen shot). Uncheck the reminders that you do not want to display. Once your changes are saved, you will see the updates appear in the sidebar. Below is an example of the reminders displayed in the sidebar. What are Alerts in online banking? I am signed up for Alerts but haven't been receiving them. Why? How often will I receive an Alert in RCU Online banking? How do I remove an Alert I no longer want in RCU Online banking? 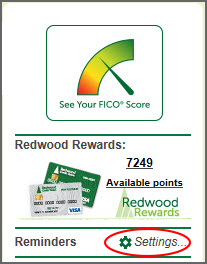 Are there Default Alerts I can use in RCU Online banking? How do I set up alerts to send a text message to my mobile device? How do I set up a loan payment alert? How do I use Alerts in the RCU Online banking?